﻿These "medium" earrings of the PIRANHA collection by ISABELLE LELOUP JEWELRY are handmade in Belgium. 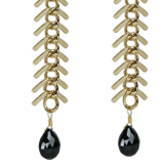 They are made in Gold-plated Brass and are embellished by a faceted, drop-shaped blue Opal gemstone. A trendy and elegant design, that will enhance every type of outfit. - Pierced ears hook with butterfly clasp.